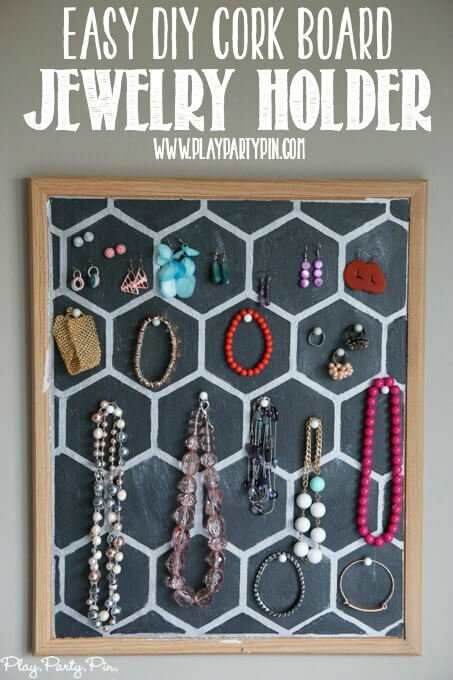 This DIY jewelry holder is quick and easy to make and is a great idea for how to keep your jewelry organized! One of my goals for this summer is to reorganize my closet. Right now it’s full of clothes that don’t fit, shoes I don’t wear, and a ton of jewelry that I can’t find because it’s buried under piles of clothes and other random junk. Last weekend I went through all of those old clothes and put them in buckets and this week my project is organizing my jewelry. To be honest, I don’t wear a ton of jewelry but it’s not because I don’t love jewelry, it’s because I can’t find it. And that’s why I made this cute DIY jewelry holder. I’m hoping that having somewhere cute to put my jewelry means I’ll actually put it there. And wear it more often because I’ll be able to find it. 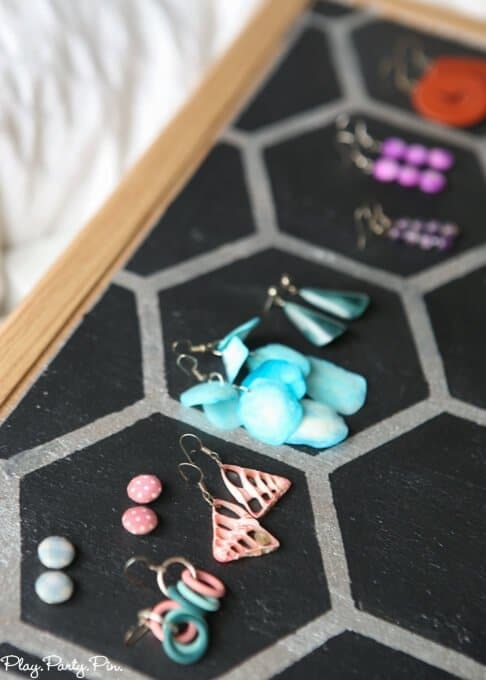 This jewelry holder is so simple to make. 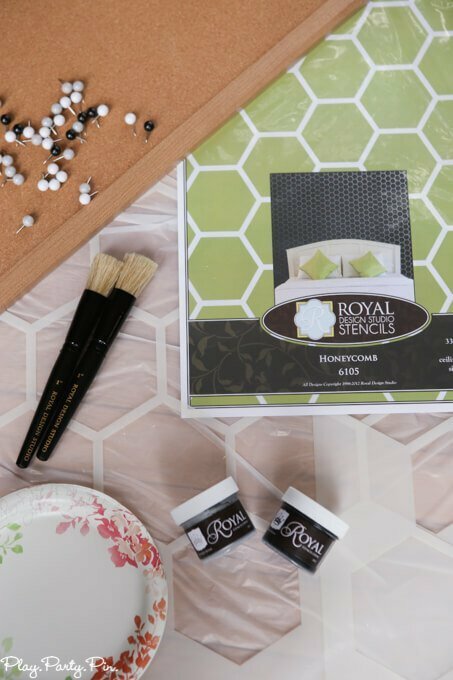 Thanks to Royal Design Studio for providing me with the awesome honeycomb stencil, stencil cremes, and stencil brushes that I used for this project! 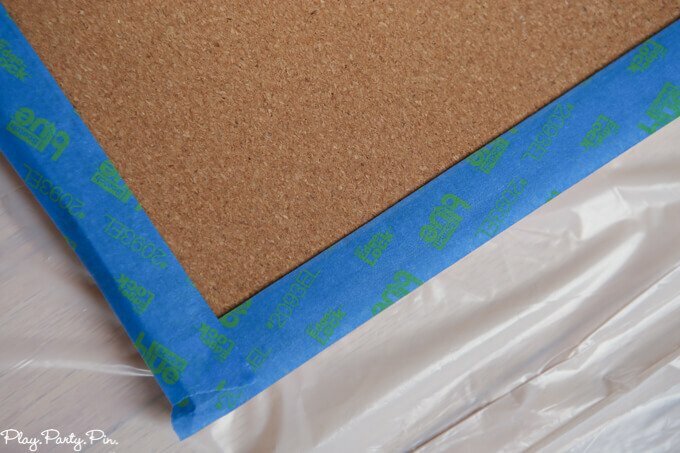 First, tape off the edges of the cork board so you don’t paint on the edges. 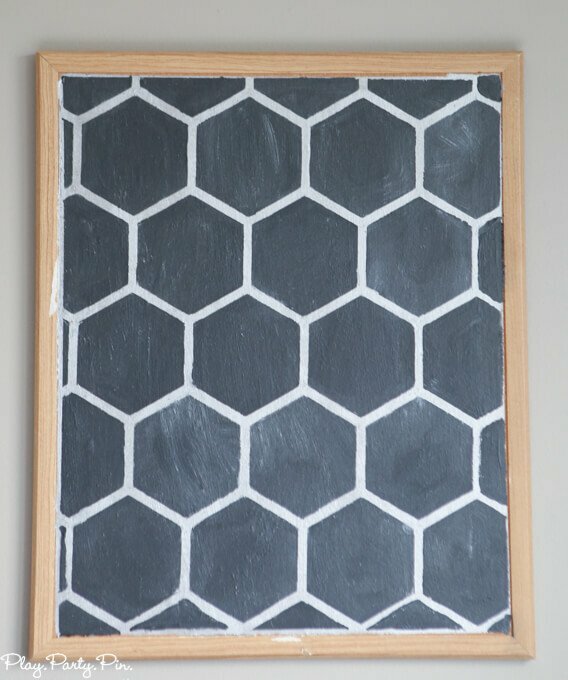 Then paint the entire surface of the cork board with the lighter of your two colors. 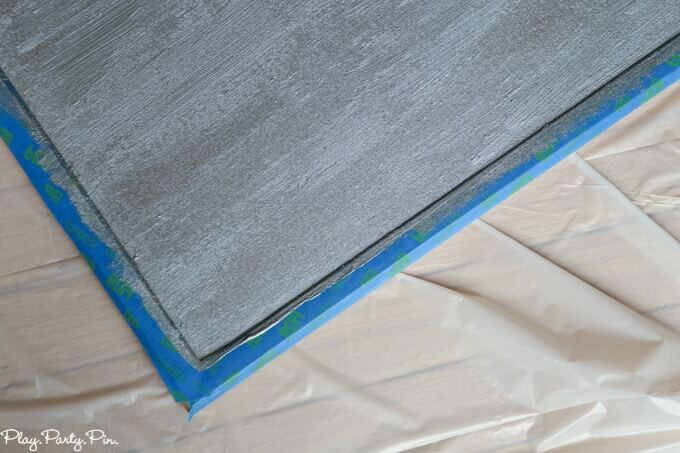 As soon as you finish painting the first color, remove the tape then allow the paint to dry. Once the paint is dry, cut the stencil to the size of the inside of the cork board. Spray the back of the stencil with the adhesive spray and press it down on the cork board, making sure to avoid any bumps or bubbles in the stencil. 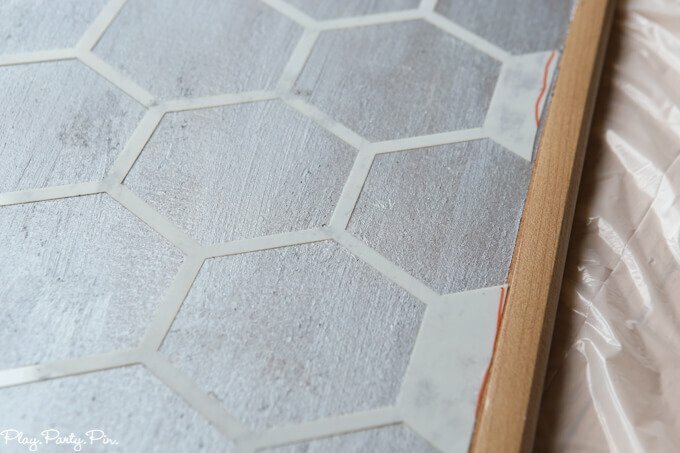 The Royal Design Studio Honeycomb Allover Wall Stencil was perfect for this because it actually came with a ceiling filler stencil that allowed me to fill in the stencil on the edges to make it look uneven all over rather than having a lopsided, unfinished honeycomb look. 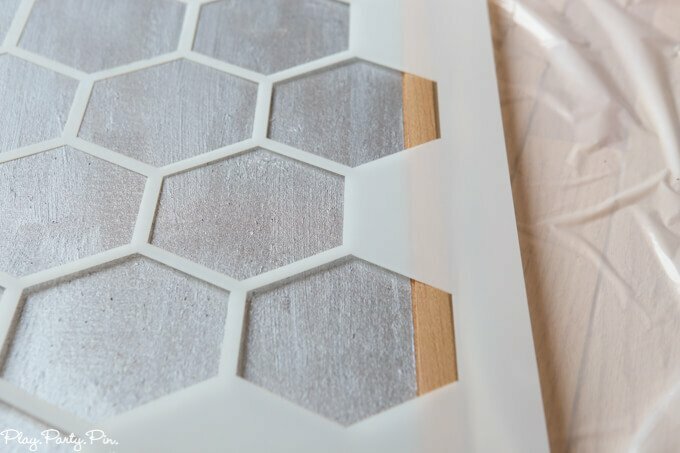 Once the stencil is adhered to the cork board, tape the outside of the cork board again, and paint inside the honeycomb stencils with the darker stencil creme. 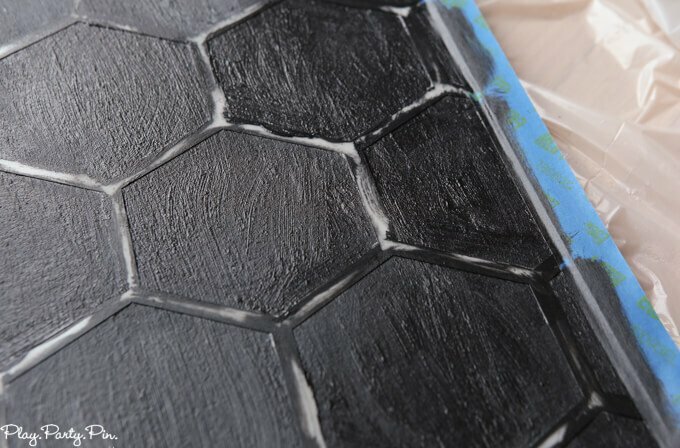 Remove the stencil as soon as you’re done and allow paint to dry. 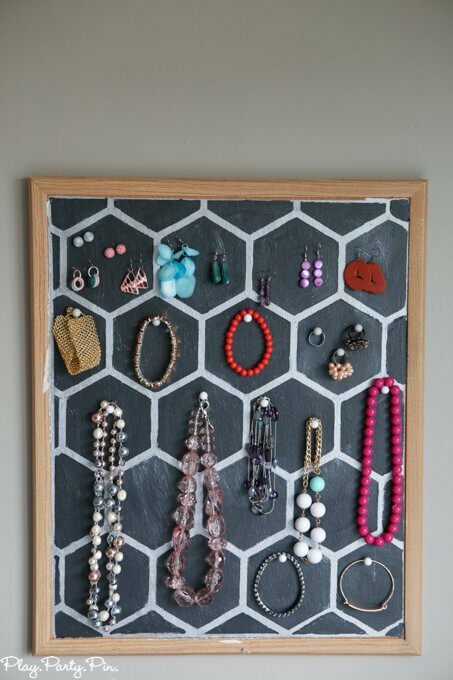 Now that your cork board is painted, figure out where in your house you want to display your masterpiece. 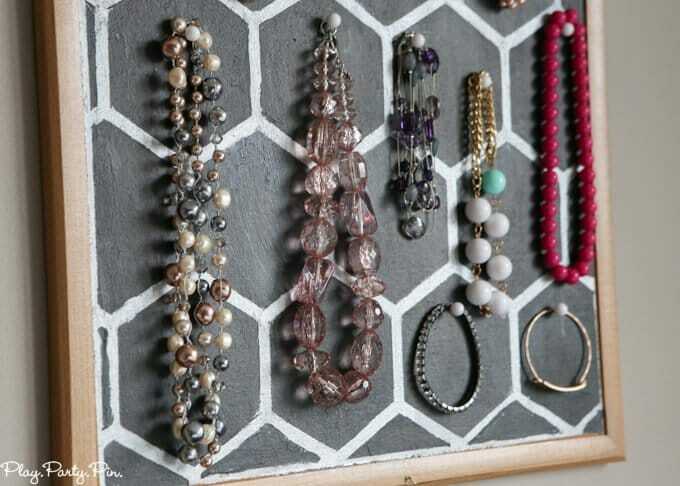 Then just use your push pins to hang jewelry however you want. I love how it adds the perfect decorative element to our otherwise bare walls.